The last step to YOUR product’s perfection. Have you ever tried to read something in a language you do not know? Can you read any of these? All of these? Our exclusive DTP team can! Translations ABC has a professional desk top publishing (DTP) department focused solely on delivering the highest-quality multilingual product possible. Our graphic designers—our desk top publishing team—are professional linguists. How do you spell perfection? A story: a colleague wanted a simple 5”x4” post card done with various languages—correct words supplied to graphic designer—on the front of the card. When it was time to proof the card, it was a disaster! The double-byte characters were corrupted, languages that are meant to go from right to left (bi-di)—didn’t. In fact, they had been flipped, so that everything was backwards—and going in the wrong direction. The graphic designer was great as a graphic designer, but was not a linguist so did not even realize that the languages were not correct. You have a deadline for a multilingual project. You got a great price from a large firm. The project is delivered on time—great! Before heading off for a relaxing weekend away from the office, you take a cursory look at it before sending it off. You know that sinking feeling one gets when something is wrong? Terribly, terribly wrong? Corrupt characters, wrong font type, wrong titles under the images, images facing the wrong way for your bi-di languages…. Disaster! Time to cancel weekend plans—again. That is what happens when trust is put into someone who does not possess the winning combination of skills in graphic design AND professional languages skills. You need a One-Stop DTP Shop. Translations ABC provides your much-needed one-stop-shop solution. Our DTP department keeps current with the latest technology while still maintaining the know-how and software for older programs for clients who love their “old reliables”. We provide one-on-one customer service. We care about our clients and we want to take some of the stress off your shoulders by consistently providing the highest-quality, on-time, within budget deliverables. 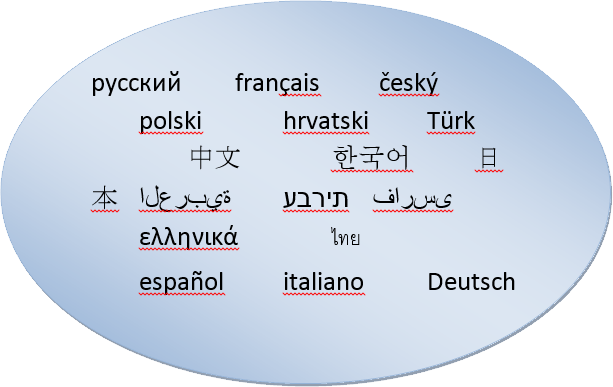 Do you need any of these done in one—or many—languages? Our specialization: Arabic and Asian characters. How does this benefit you—our client? Contact us now and enter a world where you are treated as you ought to be: with respect. Where promises made are promises kept, and quality means QUALITY.